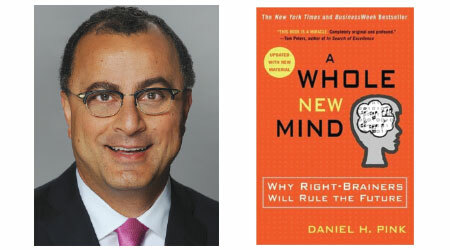 I recently read “A Whole New Mind” by Daniel Pink based on a recommendation of a friend and a business leader in my community, whom I respect. I found the book to be more complex than what I anticipated, and rather full of excellent concepts. I am planning to work my way back through it in the next few months. The book is geared towards the business leader, yet I found all the concepts discussed applicable to day-to-day life. The book deals with how we show up at work, and our propensities in American business to be “left-brain” dominant, which squeezes out our “right-brain” way of thinking and being. Pink describes the minds of right-brain thinkers as closely matching the minds of inventors, storytellers, creators, and emotionally intuitive and relational people. He contends that the future will undoubtedly be in the hands of these right-brain thinkers. The need for “a whole new mind” is born out of the continued growth in global outsourcing of “left-brain type roles.” The takeaway is the need to become intentional around resurrecting the right-brain “six essential aptitudes,” as Pink describes them in the book. By being intentional around these six core areas, we can engage right-brain qualities that are critical to success in business and life. While one may not agree with each concept the book presents, the data, stories and recommendations still will make an excellent read and discussion topics for building service contractors and their teams. The book is packed with lots of good research and practical suggestions of what to do with this information, and how to engage and develop your right-brain. This is a great book to read and process with your teammates, as it challenges conventional thinking on many fronts, and engages right-brain thinking in the process, even in the way it is written. A discussion around each of the six areas, their application in life and business, and how to develop those areas can be most helpful in business and life. According to author Daniel Pink, the future belongs to a different kind of thinker — the artists, inventors and others who are creative. The next generation of business leaders also will be those who show empathy and have fun. In “A Whole New Mind,” published by Riverhead Books, Pink uses research and case studies to define six human abilities that are fundamental for future success.